Television personality Ruriko Kojima (left) and former Rakuten manager Hiromoto 'Dave' Okubo speak in front of the Easton Hit Lab on Tuesday. U.S.-based baseball equipment manufacturer Easton, one of the largest baseball brands in America, is making a foray into the Japanese market, the company announced earlier this week. Along with its products, Easton is bringing along some technology it hopes can help shape the future of youth baseball in Japan while also carving out a niche for itself. Easton’s Japan general manager, Dan Beamer, was among the executives on hand at a media event at the Tokyo Yakult Swallows’ indoor facility this week. Easton is bringing its line of bats — the Japanese team that won the Little League World Series in 2015 used Easton bats — and other products to Japan and will also offer products specific to the Japanese market. “Before, Easton had never made products specifically for this market,” Beamer said. Easton also displayed its Hit Lab and Easton Power Sensor, which won positive reviews at the Consumer Electronics Show (CES) in Las Vegas last month, during the event. The Hit Lab is an innovative swing analysis system that uses Hit Trax, a virtual batting simulator which captures batted ball data and can be programmed to show, for instance, where a ball would land in Fenway Park, and the Easton Power Sensor (which may be available in Japan next year), a motion sensor that is attached to the end of a bat and charts various data points and utilizes video capture to analyze a player’s swing. Those elements come together to deliver real-time metrics that can be used by players and coaches and also shared on social media or via email. 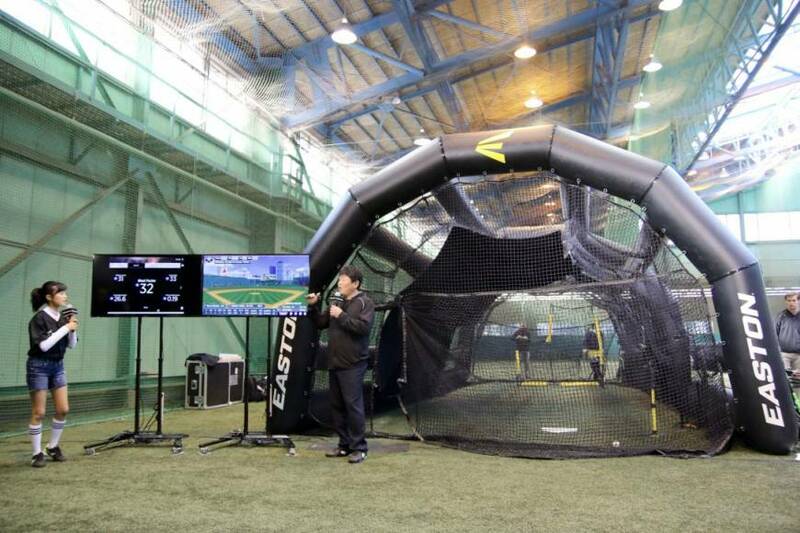 Former Tohoku Rakuten Golden Eagles manager Hiromoto “Dave” Okubo demonstrated the system during the press event. Easton has taken the Hit Lab around to various spots in the United States already. The setup shown off at the press event will remain in Japan. Among its more traditional product offerings, Easton will have to go up against domestic giant Mizuno, as well as Nike and other brands in a competitive marketplace. It won’t likely be easy early on, especially given the tendency of Japanese consumers to lean toward products from familiar companies. Beamer, however, feels Easton can find its corner. “We want to bring our performance philosophy of sports engineering,” he said. “It’s not just words, we really do live that. We want to bring the Easton experience with the Hit Lab and we want to bring a fresh look to baseball. Something the kids are going to think is cool and maybe more fun.